Life has been amazing. I have a new brother, Maximus. And he is my blood brother. Our mom and dad are the same. At first I wasn't so thrilled to have him around, but now I realize it is the best. When my human mommy and daddy go to work I'm not lonely anymore cause Maximus follows me wherever I go. Sometimes I want to be alone but Max won't here of it. But that is okay. I love having him around. Check out this link. 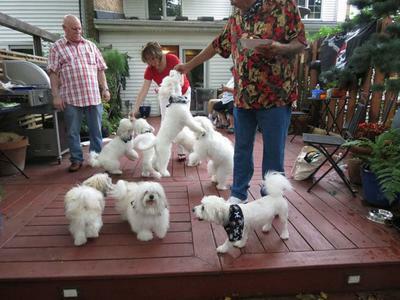 To celebrate the new member of our family, I had a party last week and got my family together. Only one member of the family was missing cause he was away on vacation. We even made it into the staten island advance as you can see from the link. Going to try to make this an annual event and open it up to other Cotons in the area. Max and I will let everyone know if it happens next year. Hope everyone is having a good summer. I know I am. What a wonderful thing. I can't even imagine all those Cotons in one place - how fun! This is awesome! Wish we knew Spanky's family! 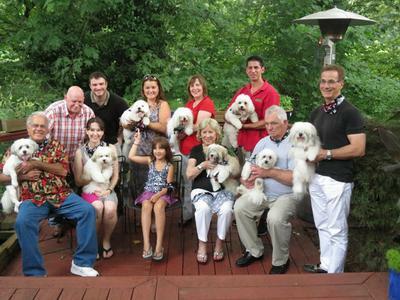 What a wonderful picture of all the Coton's together & what a wonderful idea to have an annual Coton reunion. Thanks for sharing the picture & idea. IT IS GREAT YOU HAVE A NEW BROTHER AND HOPE YOU SHARE YOUR TOYS AND HUGS FROM MOMMY WITH HIM. AN ANNUAL EVENT IS SUCH A GREAT IDEA, ENJOY ALL YOUR ATTENTION! ALL OF YOU DOGS ARE SO GORGEOUS BUT THEN AFTER ALL -- YOU ARE COTONS, RIGHT?